Collies like this are coming to Alden’s Kennels, 6810 Barnard Mill Road, Ringwood, from 9 a.m. to 3 p.m., Saturday and Sunday, Feb. 19 and 20 for the Central States Collie Club annual specialty show. The event is free to spectators. I can’t tell you how excited I am about the upcoming Central States Collie Club specialty show Saturday and Sunday, Feb. 19 and 20, at Alden’s Kennels, 6810 Barnard Mill Road, Ringwood. And I don’t even have a collie to enter in the show. So, if my eagerness to attend the show isn’t related to the possibility that my dog might win, what is it then? For many spectators, such as me, the opportunity to see 70 or more collies is a very worthy way to spend an afternoon. Few dogs are as regal and well-tempered as the collie. They’re loyalty is unsurpassed. Of course, I’m generalizing. But, my generalization is well supported. See, this won’t be my first time at a collie club show or at the Central States Collie Club show. However, it will be the first time I’ve attended one of their shows in at least two decades. 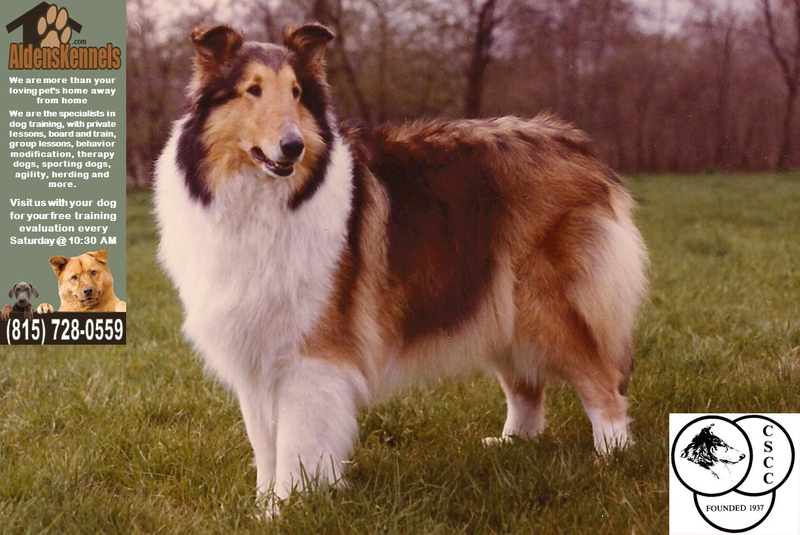 Prior to that, I attended many a Central States show, not to mention innumerable collie and all-breed shows. I’ve traveled to dozens of states to attend these shows. The truth be known, the last time I traveled out of town to a show I was in my early teens. That translates to four decades ago. I was raised with collies. Not in the same sense that Romulus and Remus were raised by wolves but I did reside at the same address as several dozen collies. My parents raised and showed the dogs and were relatively successful at it. At one point, my father was the president of the Central States Collie Club. I can remember attending club meetings at the VFW in Mt. Prospect. One year, one of our dogs, Champion Tewksbury Gentle Persuasion, won the CCA – the Collie Club of America show. For years, when telling people about that, I’ve compared the CCA to winning the Super Bowl. We called him Wolfie and he was something to see. His sable coat was full and flowing, especially after a grooming (if you want to see what I’m talking about first hand, you should come out to the club’s specialty show). The shows were exciting but none more so than the Central States shows. At the time, they were at the Lake County Fairgrounds. We’d arrive the night before with several other members and go into one of the buildings across the way where the wooden pieces for the show rings and the rubber mats were stored above some offices. The rings were made of eight-foot plywood panels that were painted a light blue. A stack of panels was a hefty affair but nothing compared to the mats. Those suckers weighed a ton. Not literally, but they were very heavy. The next day, we’d arrive at the fairgrounds bright and early. After helping to unload our car and setup our crates and grooming table (our part of helping was often just holding the dogs on leashes while our parents did the heavy lifting), we’d wander off to see if there wasn’t anything else we could help the club with. It wasn’t that we were surprisingly benevolent for children our age; to us, it was all a big game. Sometimes, the adults would even allow us children to serve hotdogs, chips and pop where they formed several tables into a makeshift diner. For a 10 or 11 year old, that was great fun. We were able to play adult by actually performing adult duties. Eventually, the building would fill with collies and their owners. Participants setup along the walls and began preparing for the show. Everyone had a typed program that showed the times of the shows. The majority of the action was conformation where the dogs were judged based on how close they came to the collie standard. There were some obedience classes, too. I enjoyed the show, especially when my mother or father was out in the ring showing. And if our dogs won, well that was just fantastic. But, the highlight for me was junior showmanship. In junior showmanship, children up to age 17 would bring a family collie into the ring and run it around the ring in accordance with the judge’s orders. It was just like when the adults were showing the dogs only now, instead of considering the dogs, the judges were watching the young handlers. I did fairly well in junior showmanship, as did my brother and sister. We were successful enough that we needed to establish small trophy areas in our rooms – miniature versions of the trophy room my parents had downstairs. Of course, I’m not 10 anymore. I doubt I’ll help to serve hotdogs, chips and pop, though I’m willing if they need the help. I probably won’t show any dogs and, if somehow I did, I’m a little too long in the tooth to enter junior showmanship. So, it will be different. Still, I’ll have an opportunity to bring a 10-year-old friend along to the show. It will be her first time at a collie show. One of the benefits of bringing her to the show is I get to see the event as though through her eyes. In any case, whether a five year old, 10 year old or 54, from my perspective, there isn’t a better place to be Feb. 19 and 20 than Alden’s Kennels for the Central States Collie Club specialty show. I’ll be there but don’t come out to meet me. Come to meet the collies. You won’t be sorry. For more information about Alden’s Kennels, visit our Web site, or visit our Facebook page. This entry was posted in Pet Events, pets dogs training. Bookmark the permalink.